The latest facts on DUI: When you’re legally considered drunk, what to expect if you’re pulled over, and how to prevent high and drunk driving. Advances in toxicology have made it possible to gather new information about the prevalence of drug use by American drivers. The National Roadside Survey found nearly 20 percent of the drivers tested were positive for drugs. Driving while impaired is against the law in every American state and the District of Columbia. Whether a driver is intoxicated by alcohol, drugs, or a combination of both, driving while impaired is a dangerous and preventable act. Legal standards for intoxication are based on an individual’s blood alcohol content (BAC). BAC measures the concentration of alcohol in a person’s blood and is expressed as a percentage. Commonly called DUI for “driving under the influence,” most states set the legal limit for intoxication at .08% for drivers who are 21 years of age or older. However commercial drivers, like tractor-trailer drivers can be convicted of drunk driving with a BAC as low as .04%. Following recommendations from the National Transportation Safety Board, some states are considering lowering their legal intoxication limit to a BAC of .05%. Utah has adopted a .05% BAC effective December 30, 2018. Delaware and Washington may be next. If you’re injured because of an intoxicated driver, here’s How to Prove Liability After Getting Hit by a Drunk Driver. 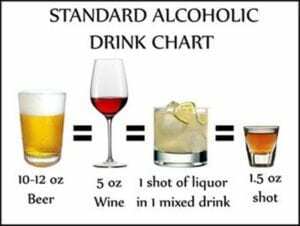 Based on standard American drinks, a BAC level can be generally calculated according to the number of drinks consumed. It’s very important to remember that many factors affect intoxication, including gender, body mass, general health, and lack of sleep. In other words, you may be too drunk to drive safely even after one or two drinks. While every state has a legal limit for DUI, those laws only pertain to adults. If you’re under 21 and under the influence, there is no acceptable limit. Intoxicated drivers under the age of 21 are 17 times more likely to be killed in a crash than if they hadn’t been drinking. Every state and the District of Columbia has a “zero tolerance” policy when it comes to underage drinking and driving. Underage DUI that results in fatalities or severe injuries may also lead to civil lawsuits against the driver or an underage driver’s parents. DUI is more than a traffic violation. A conviction for drinking and driving is considered criminal in most states and may rise to the level of a felony offense if the drunk driver caused an accident or injuries, no matter the driver’s age. A DUI conviction can later show up on background checks for sensitive security clearances, even if the juvenile records were sealed. Many DUI arrests start out as routine traffic stops. The driver is pulled over for speeding, driving too slowly, crossing the center lane, or caught in a sobriety checkpoint. The officer will be evaluating the driver from the start and looking for clues of intoxication such as slurred speech, bloodshot eyes, nervousness, fumbling with the license and registration, and the smell of alcohol or marijuana. The officer will likely ask if the driver has been drinking, and how much. The driver will be asked to get out of the car. The officer may conduct a field sobriety test to establish probable cause for a DUI arrest. If the officer has a dash or body camera, the testing is recorded as additional evidence. The driver may also be asked to take a “breathalyzer” test to determine their blood alcohol level. The driver will breathe into a small device through a small tube, resulting in a digital readout of the persons BAC. Most states have “implied consent laws” meaning that if you’re driving in the state, you agree to submit to sobriety tests when asked. If you refuse to take a field sobriety test or a breathalyzer test you can be immediately arrested and will probably lose your license to drive. Drivers injured in car accidents will almost always be tested for drugs and alcohol at the hospital. Medical records proving the driver was DUI can easily be obtained during civil and criminal legal proceedings. If the at-fault driver doesn’t survive the crash, similar drug and alcohol tests are usually conducted by the medical examiner. Other victims of the accident will seek those records during legal proceedings against the deceased driver’s estate. A driver impaired by drugs is just as dangerous as a drunk driver. Drug-impaired driving can be caused by the use of prescription medications, over-the-counter medications, marijuana, and illegal street drugs. After alcohol, marijuana is the most commonly used substance by drivers involved in serious crashes. Even in states that have legalized marijuana for medical or recreational use, driving under the influence of marijuana is illegal. Motor vehicle accidents continue to be the leading cause of death for American teens. Impaired driving is one of the main reasons for the loss of so many young lives. Among teenagers, driving while high on marijuana has surpassed drinking and driving. When surveyed, one in eight high school seniors admitted to driving under the influence of marijuana in the past two weeks. Part of the problem is misinformation about marijuana use and driving. In a survey conducted by Liberty Mutual Insurance and Students Against Destructive Decisions (SADD) about one-third of teens believe that driving while high on marijuana is legal. About 40 percent of the students surveyed think driving while high is safer than driving drunk. It bears repeating that driving under the influence of marijuana is illegal in every state, for every driver. Don’t risk ruining your life and putting others in danger by not planning ahead. Never get in the car with a driver who has been drinking or using marijuana. Take the keys to prevent the person from driving. Even if they get mad, it’s better than letting them drive. Help is available for individuals struggling with an alcohol or drug problem. Whether you’ve already suffered the consequences of a DUI, or you’re dealing with other problems, you deserve support. No matter where you are in the recovery process, never get behind the wheel of a car while under the influence of drugs or alcohol.